Bread makers are the new trend in kitchenware and they can make your life much easier. You won’t need to buy your bread from the supermarket any more. 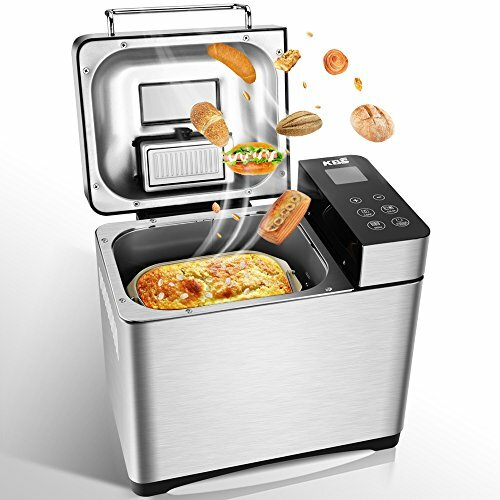 At the touch of a button, you can have your fresh, home-baked loaf in no time. The Kangbaishi (also known as KBS) bread maker is suitable for a wide variety of families—no previous baking experience required. It really does most of the work for you. All you need to do is add the ingredients. Read on to learn more about this machine and whether you should own one. This machine will enable you to bake a wide variety of bread, with its 19 settings. You will also be able to choose the quality of ingredients, using various flours, like organic or whole wheat. For those that are gluten sensitive, you can even make a gluten-free version. The Kangbaishi comes in a creamy white shade with a modern design that will blend in with any kind of kitchen decor. The dimensions of the machine are 13.7” by 11” by 11”. With an ergonomically designed upper lid which has a transparent window, you can monitor the entire baking process. The control panel is easy to use, with buttons that indicate which type of recipe you are following. The machine has an LCD display that displays the stages of each setting. You can also control the crispness and color of the bread crust. From the panel, you’re also in charge of quantity. So, you have three choices based on how many mouths you’re looking to feed: 1 pound, 1.5 pound, and 2 pounds. The machine weighs 11.46 pounds and has a sturdy base so as not to shake while kneading the dough. This bread maker is also very quiet, so you can even leave it running while everyone is sleeping. The included bread pan is made from a ceramic coating that is FDA approved. This coating isn’t just scratchproof, it also prolongs the lifetime of the pan. In addition, it’s healthier to use than a stainless steel version and is safe to use at higher temperatures. French bread and sourdough are among the types of bread you can whip up with this machine. Not to mention soft bread, milky loaf, whole wheat, and gluten-free. The Kangbaishi machine isn’t just a bread maker, though. You can make other recipes with it as well—which means it is a helpful, multitasking tool in your kitchen. Some of the other settings include fruit jams, cakes, yogurt, pizza dough, and sticky rice. A delay timer feature postpones the start of the baking process so that you can have freshly baked bread at any time you choose. You can set the delay timer up to 15 hours in advance. It can also keep the bread warm for up to 60 minutes, if you can resist it that long. Essential accessories are also included, so no need to buy extras. You’ll receive a bread pan, spoon, cup, hook, and a stirring bar. It also comes with a manual that includes instructions, along with some recipes. The Kangbaishi is set at a very reasonable price compared to other bread makers out there. The manufacturer offers after-sales service. A two-year warranty is also included, with no added fees involved. Whether you’re an experienced cook or baker, or even if you have no experience in the kitchen, you can benefit from this bread maker. Many recipes with minimal intervention mean less trial-and-error disasters in the kitchen. One of the best things about this machine is that it works on your schedule. The delay feature will enable you to have your bread freshly baked at the time you desire, whether that’s after a long day at work or when guests are arriving for brunch. The machine also allows a great deal of control over the baking process, to the extent you can control the color of the crust, Perfect if you’re looking to impress, or if you like your bread extra crispy. Taking into consideration the many features the Kangbaishi offers, the price is reasonable and not too draining on the wallet. The two-year warranty can provide you with peace of mind in case something happens to go wrong. Overall, we admire the many options it offers. A multifunctional, straightforward bread machine that only requires a little work, for a warm, satisfying reward at the end of it? Yes, please.